Just a quickie today. I am working on something (not quite ready to share, sorry) but I achieved an interesting effect that I DID want to share. 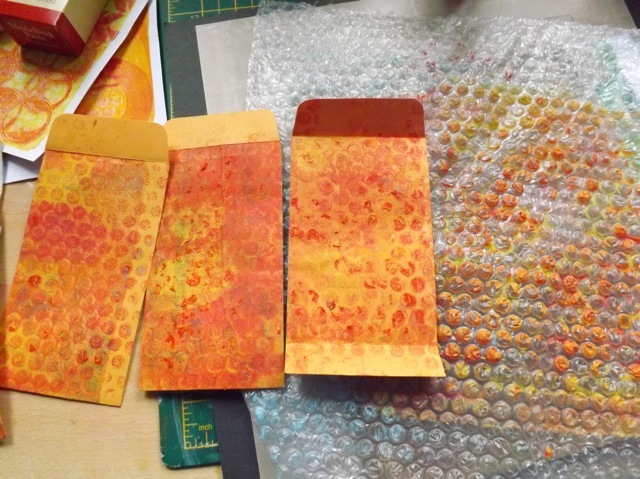 If you Gelli print, or even if you use it for other art journal type things, I’ll bet you have some mucky bubble wrap floating around. 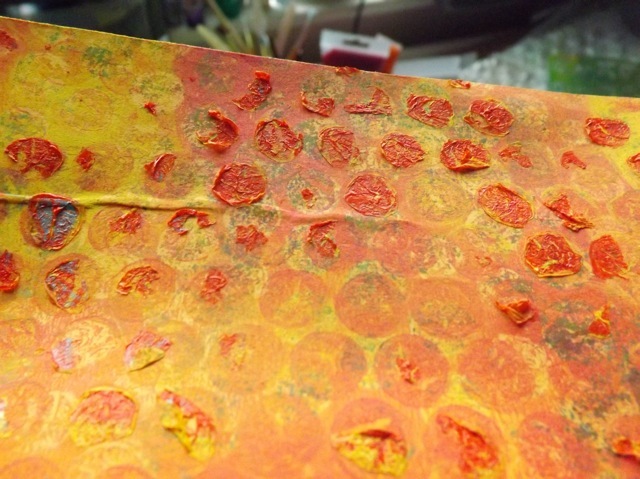 I tend to press it to the Gelli plate to impart the dotty texture to a print, but I often go a few sessions without cleaning it off. Who am I kidding? I probably have some bubble wrap I’ve never cleaned off. Sometimes, when the paint on the wrap is still wet, I’ll press it on to something else, which SORT OF cleans it but not totally. Well today I was printing on some coin envelopes and found that pressing the still-damp wrap onto a still-damp print pulls off a LOT of the paint from the wrap – thick, textured, multicoloured old paint – for an interesting result. Hard to see in the first photo but better in the second, I hope. See how textured and chunky it is? See the layers of colour? The key is the paint on the wrap needs to be wet – ideally having sat for a minute or two, to let the moisture loosen the old layers under it. And the print you are pressing (quite firmly) to needs to also be slightly damp. Once it all dries you aren’t going to get any transfer, so plan for it. I just think it looks nifty, and I have now vowed to NEVER clean off my bubbles! It’s too good to waste. I’m thinking a really layered and messy bit of bubble wrap is going to add, in a simple step, a really unpredictable and colourful texture layer with such little effort. Nice. Categories: art, Gelli plate monoprints | Tags: art techniques, Bubble wrap, Gelli, Gelli plate, how-to | Permalink.